Under the title of fascinators there are so many possibilities. Where do we begin? Any shape of any size and I love using feathers, silk and leather flowers, every creation having its individual personality. 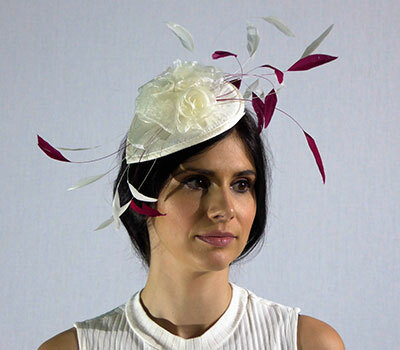 Fascinators are suitable to wear to any occasion, but if wearing one to ladies day at Ascot the only confine is the size, the base must be a minimum of 4" or 10cms from there the creation begins. 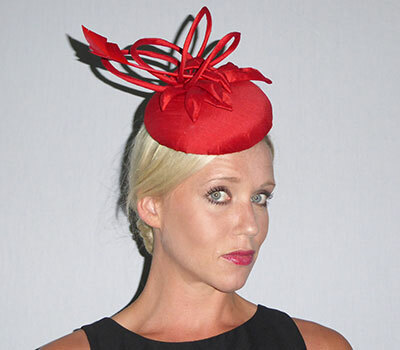 An Ascot Statement head piece that’s a mystery how it stands up. 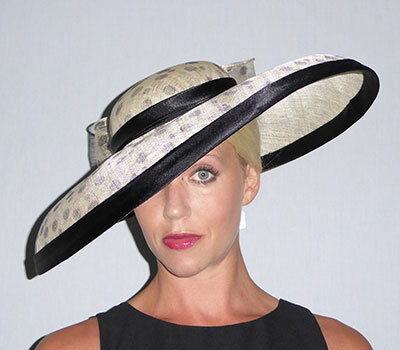 Shown in White Sinamay and trimmed in Black Swiss Braid and Feathers. Black felt Button with Black Veiling and Red bows and Feathers. Small saucer cocktail hat in apricot sinamay, black feather and spiked flower. 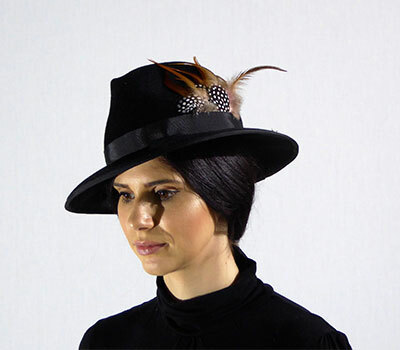 Pill box style cocktail hat in black satin with red veiling and black biot feathers. Sinamary button in Chartreuse with matching loops, quill feather and flowers. 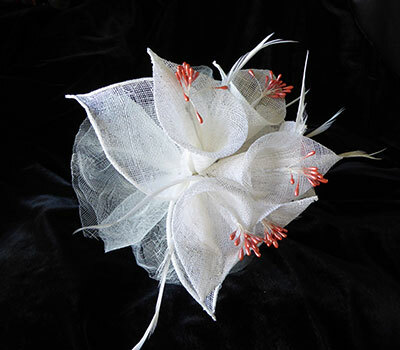 Button style fascinator in Coral Parasisal fabric with black adornments. Peacock Feathers adorn this Teal Dupion Silk button, a colour adored by many. 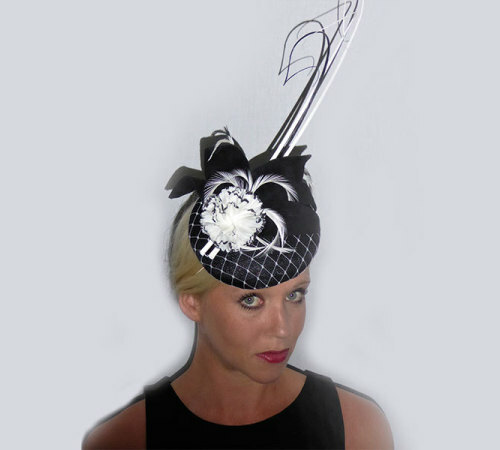 Black Sinamay button covered in White Veiling with White & Black flower, leaves & Black & White Quills. Military style beret in black with red feathers and diamante detail. Felt button in blue decorated with sinamay lillies. Bell boy style fascinator in lilac with matching flower and feathers. 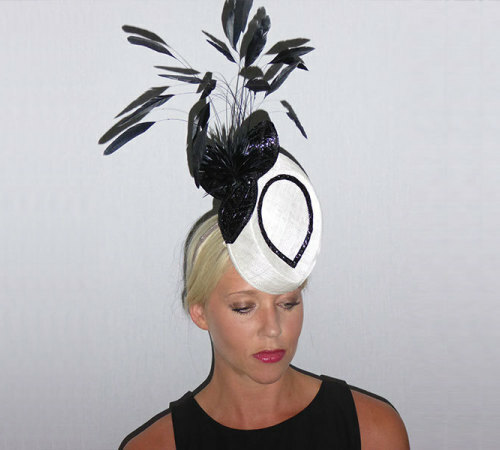 Large curled feathers set on a round base with matching veiling. Pill box style in purple felt and large black feathers. Sophisticated Red Felt Button with Black and Diamonte clasp. Small fascinator in blue sinamay decorated with cornflowers.